When you hear a mission appeal, what items in your possession flash through your mental inventory? 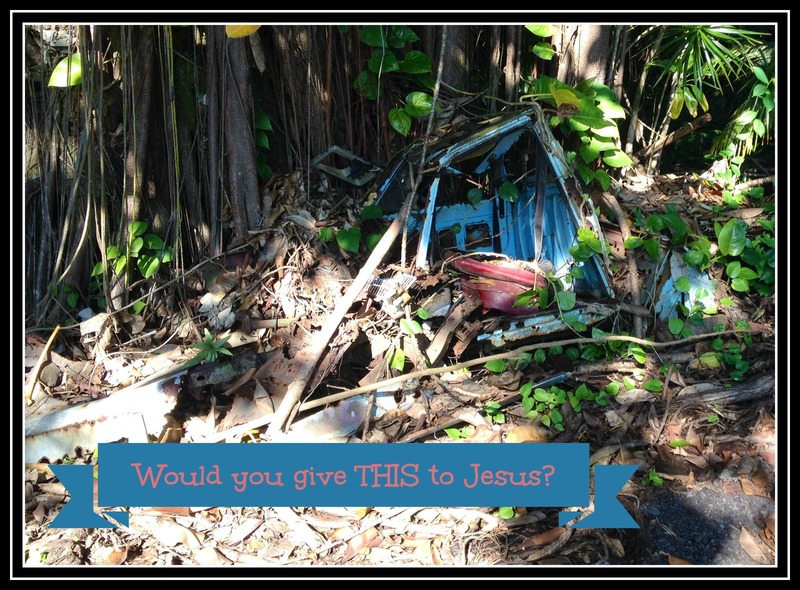 I first heard about junk for Jesus from a former co-worker who had spent two years working in Haiti after that country experienced a devastating earthquake in 2010. My friend described part of her duties at the hospital where she volunteered—spending countless hours sorting through things in the donation room—a cavernous room half the size of a gymnasium. People from around the world had emptied their attics, garages, medicine cabinets and closets to send donations to the disaster site. They sent things like band-aides that had lost their stickiness, decade’s old bottles of cough medicine, T-shirts with holes, electronic equipment that no longer worked, books with missing pages. Volunteers on site spent endless hours sorting through the donations and tossing junk—junk for Jesus, evidently. Recently, another friend at another mission received a discouraging phone call from a donor who expressed shock and concern that the mission had sent out a call for funds to purchase nice mountain bikes for the children in the community to use. The project’s developers wanted to teach students the joy of exercising in God’s creation and the value of learning how to care for equipment. The concerned caller’s attitude indicated that because the mission served the downtrodden, they shouldn’t ask for nice things for those they served—they should make do with castoffs and bicycles that needed repairs and investments of time and money. In other words—junk for Jesus. Jesus calls us to give him our junk—our emotional junk, our spiritual junk, our illness junk, our petty misunderstanding junk and festering wound junk. Jesus wants our internal junk. Nowhere in the Bible does it talk about giving our castaway possessions and the stuff that we don’t think is good enough for our comfortable lifestyle to those who we want to reach for God’s family (although there is a place for giving used things in good condition to support the gospel—but there’s a distinct line between junk and used). Think about the widow who gave her last two mites. She gave sacrificially. Think about Mary who ‘wasted’ the equivalent of an entire year’s wages on a bottle of perfume—and then poured it out on Jesus’ feet. Stories of those extravagant gifts of one’s last or one’s best made it into the Bible. When the offering plate passes in front of me, I often scramble for change in my pocket or a dollar bill in my purse. When the church committee asks me to teach a group of youngsters, I begrudgingly agree, because I feel obligated, but I then find myself unprepared when it comes time to teach or, even worse, resentful that I have to spend time preparing. I’ve gotten pretty good at giving my junk to Jesus—the internal, hidden junk that he promises to heal. I have never given ratty clothes, old bottles of hydrogen peroxide and toaster ovens without the wires to any charity or mission effort. But, well, I’ve given junky efforts. Do we spend our best efforts trying to solve our internal matters and our smallest efforts at working toward eternal matters? tweet it! Do we hesitate to give sacrificially and extravagantly to missions and charities because we think that the recipients of charity don’t deserve the best? Didn’t Jesus say, ‘Truly I tell you, whatever you did for one of the least of these brothers and sisters of mine, you did for me.’ (Matthew 25:40).